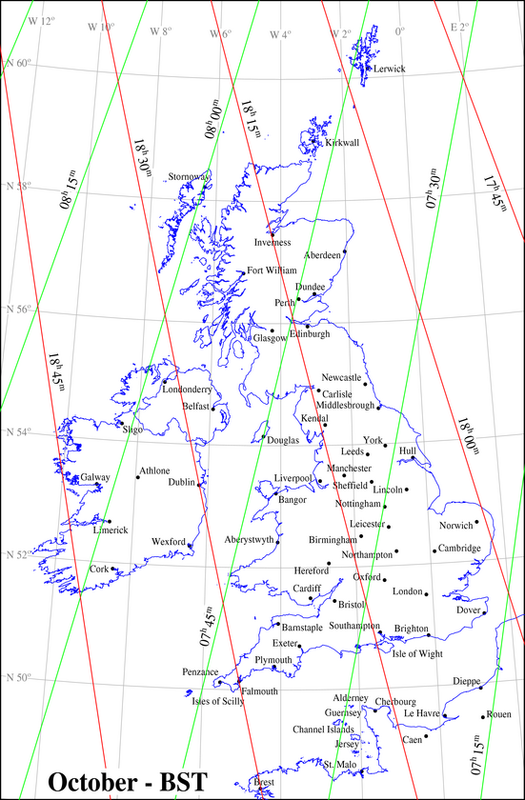 The map below shows isochrones or lines linking places with the same times of sunrise (green lines) and sunset (red lines) for the United Kingdom for mid-October. These lines show the position of the terminator, the boundary between the illuminated and dark areas of the Earth, as it sweeps across the face of the globe. At this time of the year the terminator for sunrise runs north east to south west and that for sunset runs north west to south east. South-east Kent has the earliest sunrise and the Isle of Lewis in the Outer Hebrides has the latest sunrise. The earliest sunset takes place in the Shetland Isles and the latest sunset takes place in the Isles of Scilly. The time system used in the map is British Summer Time (BST) which can be regarded as UTC for the purposes of this exercise. For example, we can see that sunrise in Stornoway occurs at 08:00 BST and sunset in Inverness occurs at 18:15 BST. If the United Kingdom elected to move to Central European Summer time (CEST), two hours in advance of UTC for the Spring and Summer months, this would mean darker mornings and lighter evenings. For example, sunrise in London would take place at 08:24 CEST and sunset would take place at 19:09 CEST. In Glasgow, sunrise would take place 08:47 CEST and sunset at 19:18 CEST. In the case of Northern Ireland, sunrise times would occur between 08:50 CEST and 09:00 CEST. Stornoway would see the Sun rise at 09:00 CEST and set at 19:22 CEST. Remember! The clocks go back one hour on the last Sunday of October at 02:00 BST and move from British Summer Time to Greenwich Mean Time. If the United Kingdom adopts the Central European time zone, then clocks will go back on the same date at 03:00 CEST and move from Central European Summer Time to Central European Time.